The purpose of this study is to gain a holistic view of the precision medicine market in terms of various influencing factors, such as recent trends, technological advancements, and role of various key stakeholders in the market. The report constitutes an in-depth study of the global precision medicine market, including a thorough analysis of the products across different regions. The study also presents a detailed analysis of the market trends, and the market size for the period 2017-2028, wherein 2017 is the base year, and the years from 2018 to 2028 constitute the forecast period. The report covers all the prevalent trends which are expected to play a significant role in the growth of the market over the forecast period. It also highlights various drivers, restraints, challenges, and opportunities which are expected to influence the market's growth during the forecast period. The report is focused on the global precision medicine market; ecosystem and technology, application, their market dynamics, growth prospect mapping, SWOT analysis, Porter’s Five Forces, market share analysis, pipeline analysis, and country-wise analysis. The study provides a holistic perspective on the market growth, in terms of revenue estimates, across different geographies which include North America, Europe, Asia-Pacific (APAC), Latin America, and Rest of the World (RoW). The report provides cross-sectional analysis of the global precision medicine market in terms of market estimates, and projections, for all the segments across different geographical regions. The regions have been further segmented to cover the in-depth country level analysis. The North American region has been segmented into the U.S., and Canada. Similarly, Europe has been further segmented into the U.K., Germany, France, Spain, Italy, and Rest of Europe. Asia Pacific has been segmented into China, Japan, Australia, India, and Rest of Asia Pacific. Latin America has been segmented into Brazil, Mexico, and Rest of Latin America. Moreover, Rest of the World (RoW) has been further segmented into Middle East and Africa. The key players which have been contributing significantly to the precision medicine market include Abbott Laboratories, Almac Group, Amgen, Inc., Astellas Pharma, Inc., AstraZeneca PLC, ASURAGEN, INC., bioMerieux SA, BRISTOL-MYERS SQUIBB COMPANY, CETICS Healthcare Technologies GmbH, Eli-Lilly and Company, F. Hoffmann-La Roche AG, GE Healthcare, GlaxoSmithKline, IBM Corporation, Illumina, Inc., Intomics A/S, JOHNSON & JOHNSON, Laboratory Corporation of America, Merck KGaA, Novartis AG, Pfizer, Inc., QIAGEN, Quest Diagnostics, SANOFI, Teva Pharmaceuticals Limited, and Thermo Fisher Scientific, among others. 8.27 Menarini Silicon Biosystems, Inc.
8.28 Merck & Co., Inc.
8.32 Pacific Biosciences of California, Inc.
8.40 Teva Pharmaceuticals Industries Ltd.
8.41 Thermo Fisher Scientific, Inc. There has been a continuous search in the medical world for better treatment and prevention approaches for various infectious and non-infectious diseases, paving the way for the most awaited changes in personalized medicines. In recent years, the impressive research on biologics for the development of DNA, the study of the human genome, and the development of precision diagnostic tools and software has opened new hopes to develop promising precision medicine for different types of cancers, infectious diseases, and rare and orphan diseases. Advancements in genome analysis, especially in the development of vaccine platforms and accelerating adoption of companion diagnostics in routine healthcare procedures, coupled with ongoing clinical trials, have resulted in the evolution of precision medicine – a healthcare model (comprising treatment, practices, and healthcare products like medicine) that is customized as per the patient. The purpose of BIS Research study on global precision medicine market is to gain a holistic view of the precision medicine market in terms of various influencing factors, such as the trends, regulatory frameworks, and technological advancements. The report constitutes a detailed study of the different kinds of products and technologies associated with the global precision medicine market. The market has been segmented into “ecosystem”, “application type”, and “region”. The report presents the reader with an opportunity to unlock comprehensive insights with respect to the market and helps in the reader form well-informed strategic decisions. The research uncovers some of the substantial parameters that must be taken into consideration before entering into the market. The global precision medicine market is anticipated to reach $216.75 billion by 2028, witnessing a CAGR of 10.64% in the forecast period 2018-2028. Some of the factors such as the emergence of liquid biopsy, increasing demand for multiplex assays to target emerging diseases, reduced adverse drug reactions through pharmacogenomics testing, and increasing focus on target-based therapies are acting as significant factors propelling the growth of the global precision medicine market. In terms of ecosystem, the global precision medicine market is dominated by applied sciences. This dominance can be attributed to the ongoing advancements in the field of human genomics and innovation of new healthcare technologies such as next-generation sequencing, high throughput screening (HTS), and digital polymerase chain reaction (PCR). The completion of the first human genome project in the 1990s has created the platform for the development of further enhanced pharmacogenomics solutions in applied sciences. At present, government initiatives are focused on launching a large number of genomic tests and drugs, controlling the increasing level of genetic disorders, and integrating advanced technologies to fulfill the unmet needs of the patients. Most of the developments taking place in the present scenario are mainly related to oncology and cardiovascular diseases, but it is anticipated that it may target almost all therapeutic areas affected by genetic mutations. In terms of regional potential, North America is the leading contributor to the global precision medicine market and contributed approximately 47% of the global market values in 2017. This can be attributed to increasing usage of genomics and pharmacogenomics in the development of personalized medicines, and high income of patients to afford costly diagnostic and genetic tests. Also, in the year 2015, the launch of Precision Medicine Initiative (PMI) by the then U.S. president, Barack Obama, completely revolutionized the process of healthcare delivery in the nation. The initiative was aimed at irradiating the already existing “one-size-fits-all” approach of treatment and hence improve patient outcomes while minimalizing healthcare costs. In financial terms, the initiative was worth $215 million and significantly accelerated the discovery of biomedical tools, knowledge, and therapies to assist clinicians to come up with the treatment that best serves the individual need of the patients. 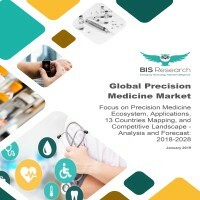 The key players who have been contributing significantly to the global precision medicine market are Pfizer, Inc., Merck & Co., Inc., Abbott Laboratories, GlaxoSmithKline plc, AstraZeneca plc, Sanofi S.A., Almac Group Ltd., Bio-Rad Laboratories, Inc. Johnson and Johnson, and bioMérieux S.A., among others.